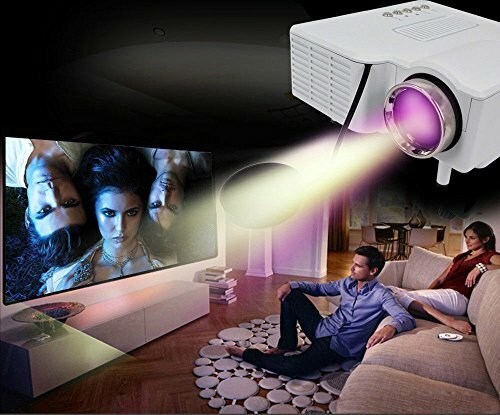 Key Features 1.Projection Technology:LCD 2.Native Resolution:QVGA (320x240) 3.Supported Resolution:1080P (1920x1080), 720P (1280x720) 4.Brightness(Lumens):400 5.Aspect Ratio:4:3 and 16:9 6.Contrast Ratio:300:1 Specifications Projection Technology LCD Native Resolution QVGA (320x240) Supported Resolution 1080P (1920x1080), 720P (1280x720) Input Voltage(V) DC12V Brightness(Lumens) 400 Aspect Ratio 4:3 and 16:9 Contrast Ratio 300:1 OSD Languages Japanese, Arabic, Spanish, German, French, English Projection Screen Size (inch) 20"-80" Projection Distance (m) 1~4 Throw Ratio Range 10-400cm Lens F=125mm Video Formats RMVB, MPEG, MOV, AVI Audio Formats CD, WAV, WMA, MP3 Picture Formats PNG, GIF, BMP, JPG Connectors HDMI Input, USB, VGA Port, 3-in-1 AV In Speakers Included Yes, built-in Lamp Type LED Lamp Life (Hours) 20000 Power Consumption (W) 24 Digital Keystone Correction ±15° Projector Type Mini Projectors Connectivity Technology Wired Color WHITE Dimension(cm) 13.5 x13.2x 5.2cm Net Weight(kg) 0.5 Package Includes: 1 x Entertainment Projector 1 x Manual remote control 1 x Charger Adapter 1 x triple video cable Notes: 1.The difference between British and American? Projector is different in plug types.? So please choose it careful. 2.? Please allow little differs due to manual measurement, thanks.